Web-Service binding allows the developer to improve performance by minimizing the HTML output and removing the need ofa page refresh. 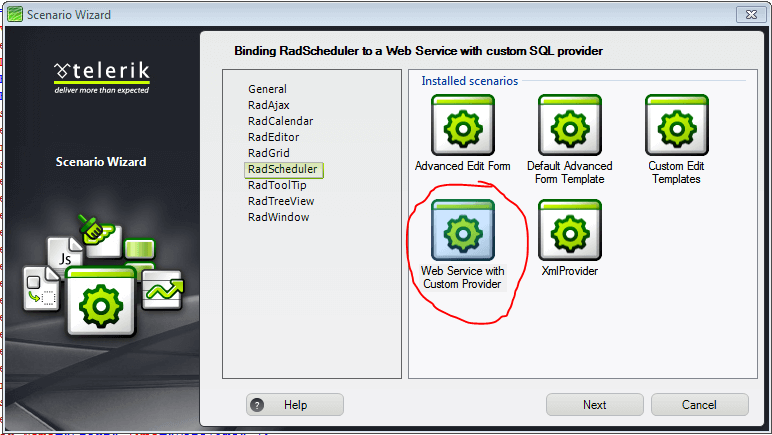 In this mode RadScheduler does not postback to the page and the appointments are rendered on the client. Currently, Resource Grouped views (GroupBy="User") are supported when using Web Service data binding for all views (DayView, WeekView, MonthView, TimelineView) only if ResourcePopulationMode="ServerSide" . Create a new web site with VS 2008. <telerik:RadScheduler RenderMode="Lightweight" ID="RadScheduler1" runat="server" Height=""
Add a new Web Service file to your web site and rename it to SchedulerWebService.asmx. 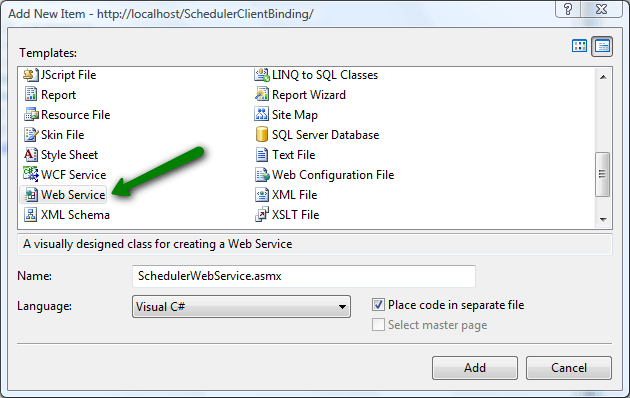 This will automatically add SchedulerWebService.cs in the App_Code folder. A Controller property of type WebServiceAppointmentController. This class is used as a wrapper for the Data Provider. /// The WebServiceAppointmentController class is used as a facade to the SchedulerProvider. [your local installation of Telerik.Web.UI controls]/Live Demos/App_Data This file contains sample data for the XmlSchedulerProvider. <telerik:RadScheduler RenderMode="Lightweight" runat="server" ID="RadScheduler1" SelectedView="WeekView" SelectedDate="2009-02-02"
Right-click on the Web site name in Solution Explorer window. Select "RadControls for ASP.NET AJAX". From the submenu choose "Add RadScheduler Scenario". Follow the wizard by pressing "Next" button and finally press "Finish". A new .aspx page will be added to your project, depending on your choice in the Scenario Wizard. All necessary references will be added to your project. Press Ctrl+F5 and run the application.